Glendessary Lane, Santa Barbara, California. PLACE. “In approaching this project, we desired a modest and respectful impact to the land, with an emphasis on intuitive functionality and aesthetic clarity. The house’s parti is programmatically divided into a sort of public bar; consisting of the kitchen, dining and living room and a more private bar; containing the family room, bathrooms, and bedrooms. The “public bar” is flanked on both ends with large sliding doors to achieve a powerful connection with the land anywhere you are in this section. The family room is a potent space in that incorporates the flexibility to be the most intimate and quiet space while also opening up to the community beyond. 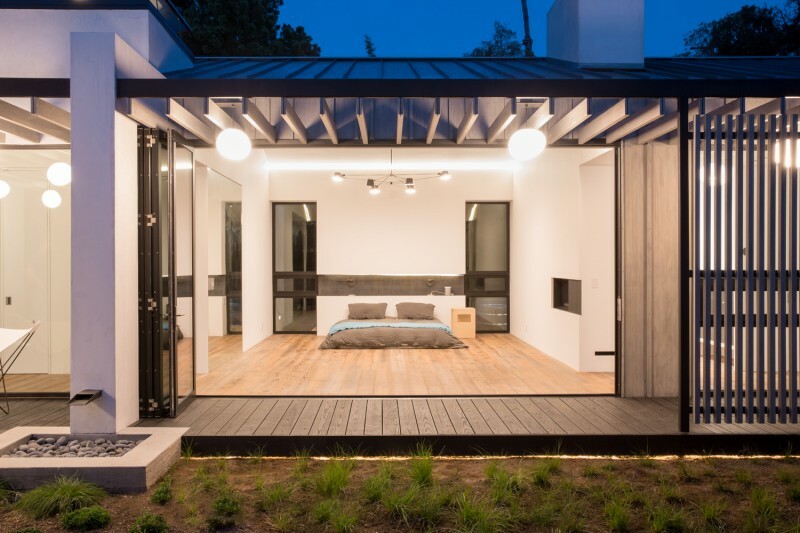 The master bedroom has the visual and visceral connection to the outdoors due to one entire wall comprising bi-folding doors that open onto a serene yard with fire and water elements.